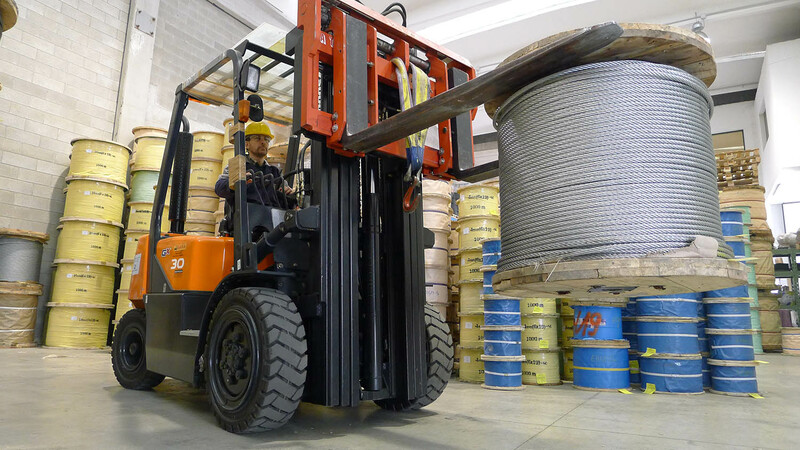 Santini Funi Srl: steel wire rope suppliers since 1990. We are worldwide suppliers of Steel Wire Ropes & Stainless Steel Cables. We are able to provide a rapid, efficient service. Thanks to our flexible structure, our rapid turnaround enables us to fulfil the needs of all our clients very quickly. Our warehouse is well-stocked with a wide range of ready-to-deliver products so we can quickly process all orders. Our wire ropes come with an “EC” Declaration of Conformity in compliance with the community directive on machines 2006/42/EC. We can provide the certifications by qualified authorities (RINA, Lloyd’s, etc.) regarding the product specifications (chemical analysis, breaking force, etc.) on request. We have selected the best suppliers worldwide to guarantee constant quality and compliance with European standards. We use a system of traceability and procedures to check the quality of our products and to be able to trace who has produced the wire rope. At the client’s request, we are able to provide machining cut to size, plasticisation, the manufacture of finished pieces (slings, flexible transmission). You can contact us by telephone for an immediate quotation, or send us an email and we’ll answer within minutes.